The problems of monoculture overtake me whenever I take some time to organize my shelves, or weed, or just gaze at them. For those authors I love (Ambler, Atwood, Brookner, Just, Pym, Shute, Stevenson, Trollope, etc.) what happens when (if) I collect all of their work? Kind of satisfying as an activity and also nice for re-reading old favorites. 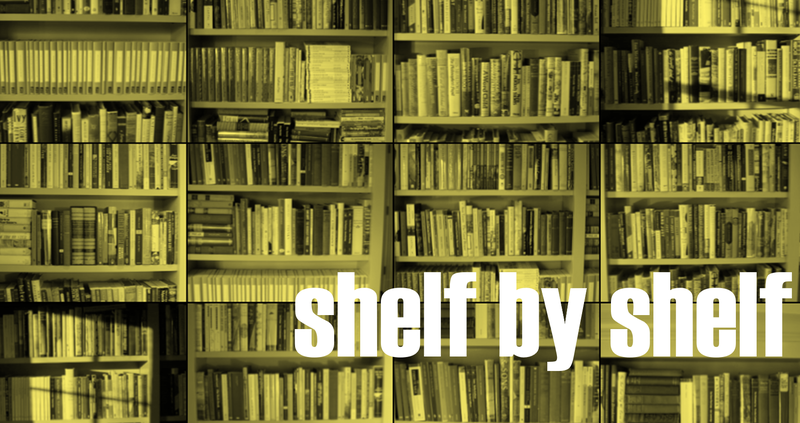 But collecting prolific writers can mean a lack of diversity if one has limited shelf space. In some cases (e.g., Atwood), I no longer feel the need to keep everything an author has written. In other cases, I think at some point, favorite authors might be relegated to special shelves elsewhere in the house. But since those shelves don’t yet exist I’ve started to wonder whether or not I want to keep every novel. Issues of relative scarcity in the marketplace for some author’s work mean that I am also more inclined to keep all of their books regardless of how much I like a particular volume. Which brings me to this week’s shelf. E.F. Benson is a delightful author best known for his Lucia series, but is he worth all this shelf space? I’ve only read one of his non-Lucia books. Do I like him that much? I don’t know. But I do know I have found lots of copies of his other work at a charity shop here in DC and haven’t been able to resist getting them. I guess I will find out at some point. In the meantime, I’ve put my boxed Folio Society set of the Lucia books elsewhere as they take up a fair amount of shelf space. This allows me a bit more room for his other works which may or may not get weeded out over time. This week also marks the first example of the horizontal stack. When one can save an inch or two my going up instead of side to side. I think it also adds a nice visual break . SHELF THREE: 36 books, 31 unread, 5 read, 14% completed. When I was at Powell’s last summer I found this beautiful copy of A Bit of French Air. 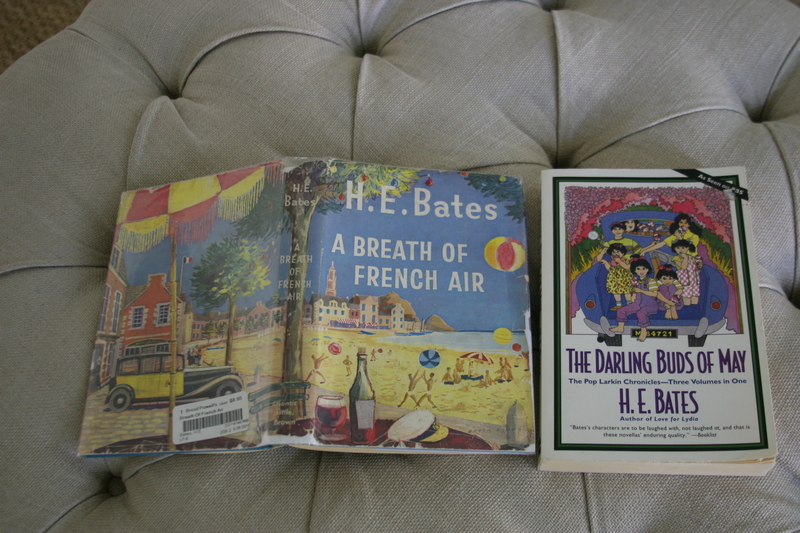 One of Bates’ Pop Larkin books, I have no idea whether I will like them. I also have a Pop Larkin omnibus that I don’t have on this shelf. If I read that and end up not liking them, I probably will keep this one because the edition is so cool. How could I resist that cover? Bechdel, Alison – Are You My Mother? When I was in college I loved reading Bechdel’s comic strip Dykes to Watch Out For in Equal Time, one of the gay newspapers in the Twin Cities. I even went approached her one year at the Pride Festival to tell her what a fan I was. I loved Fun Home but haven’t read the companion Are You My Mother? yet. I’ve written before about how much I loved The Ark as a kid and the incredible tale of how I came to own this copy and its sequel. One of the best books ever written. If you haven’t read it, I’m just not sure we can be friends. Well, yes we can, but you need to read it. I don’t own my favorite novel by Böll, The Lost Honor of Katerina Blum. I’ve read one or two others and I’m not sure I like him as much as owning four of his books would have you believe. But I need to read more to find out. Previous Article Whatever happened to these new books? Lovely shelves! And that’s a good point about the completist thing. I have amassed several Bensons and I’m not sure if I’ll actually read them, despite loving Mapp and Lucia. Maybe as you get older (as I am) there comes a time to cull those volumes you’re really *not* going to read and keep those you’re sure you want to! “Bennett, Alan – The Uncommon Reader (completed) One of the best books ever written. If you haven’t read it, I’m just not sure we can be friends. Couldn’t agree more. Have you seen “The Lady in the Van” yet, by the way? I think any Bennett fan will love this, and even more so as it has Maggie Smith in the lead. At a library sale here in Maine today I bought five Alan Bennett books, including two copies of “The Uncommon Reader” – already have one copy, read it a few years ago, loved it! All the E.F. Benson, wow. I’ve read none of those (and only started the first Mapp and Lucia novel, but wasn’t in the right frame of mind for it, subsequently made no headway and abandoned it). The authors I keep complete or near-complete works of on hand are/were not all that prolific: Laurie Colwin, Mark Helprin, Patrick Leigh Fermor, Bruce Chatwin, Siegfried Sassoon, Isak Dinesen, also working on Louise Andrews Kent, and Mary Stewart (not the Arthurian novels, but rather her terrific romantic/adventure novels). Oh, and Patrick O’Brian. There are so many other authors I want to have around in quantity, but not in entirety. The book room here is already over-full. To say the least. Absolutely with you on Bennett, and of course dear Mr. Benson (you’ve read more of him than I – although the number of times I’ve gone through all the Mapps and Lucias must count for something). Slightly off-topic, since we’re still at this end of the alphabet, but were one to want to start with D.E. Stevenson, what do you recommend as a first-to-be-read? I’ve been pondering that very thing, as I tend to collect all the works by an author I enjoy. A few years ago, my dh said, “we’re not buying any more book shelves.” I was concerned until it occurred to me to tell the kids that when they move out, their books go with them, but the shelves stay behind! Maybe by the time I reach that point, I can have “theme rooms” – sort of like Susan Hill describes in her Howard’s End is on the Landing. So far, the only Benson I’ve read is Mrs. Ames (which was very Pym-sian to me), but I have the Mapp and Lucia books on the shelf. Hopefully, this will be the year I actually get to them. I feel so relieved. I have read an Uncommon Reader…twice in fact. Love it too. Love these shelves. I have several Bates books in my Penguin collection. I enjoy him as an author too. Love these posts. Whew, I have read The Uncommon Reader, so we are good, right? I loved the Mapp and Lucia series but wasn’t curious to read any other Benson, however, Susan in TX’s comment above has me intrigued! Fun Home was excellent, I wasn’t quite as enamored with Are You My Mother?. That being said it was a fascinating companion book because there were quite a few scenes drawn from a different perspective in the second graphic novel that provided a weird feeling as I read it. I love this series! Horizontal stacks are so handy for saving space and I, too, like the look of them. HHhH is on my TBR shelf because of you and Simon. Actually, I lied, its on a floor stack because I’ve been so resistant to organizing my shelves. Plus, I went a little crazy with book buying last month due to a trip to The Strand and The Mysterious Bookshop. Need to do some serious rethinking of my shelves. So much Benson! Like you, I have stacks of him, but have only read one non-M&L book. I did start another at Christmas and must go back to it, as it was great fun. I think A.A. Milne is the only author I have more than 30 books by, and he does have his own shelf in my house, but quite a few of the books are plays… so quite slim. And we can be friends. I love The Uncommon Reader – of course. Love all the “Darling Buds of May” series. It was a TV adaptation of this that made a star of Catherine Zeta-Jones, as the beautiful daughter. If you are ever depressed and need a little literary pick-me-up – pick it up! I’m way behind on commenting on this post, but I just had to let you know how much I am enjoying E. F. Benson — I finished Queen Lucia last week and could not wait to start on Miss Mapp, which is laugh-out-loud funny. I think I must also collect the entire works of Benson. From my own shelves, I own multiple sets of Jane Austen, plus all of Barbara Pym (some in multiple); all of Laurie Colwin, and a whole lot of Trollope — not all the 47 novels, but at least 30. Also a lot of Zola. I used to own most of Dickens, but I gave some of them away recently as I’m downsizing for the big move. I adore An Uncommon Reader too. Utterly charming. I also love Benson and am re-reading the Mapp and Lucia series and also reading some of the others. Paying Guests and Secret Lives are in the same vein as Mapp and Lucia and every bit as good. An Autumn Sowing is a bit different, more serious, but I loved it too. I’m now reading Mrs Ames which is the only other one I own. You inspired me to re-listen to the audiobook of An Uncommon Reader. What a delight to hear the author read his work. Many thanks!